Bad hair and makeup appointments can happen, but they shouldn’t be happening on your wedding day. Preparing ahead of time for your bridal appointment and knowing what to expect from your hair and makeup artist can help keep you calm, collected and on schedule for your big day. When initially booking your bridal beauty artist and dropping off deposits, remember to get a copy of your contract that clearly indicates start time for your appointments, expectations for the day of your wedding, and details on a cancellation policy or if your artist is unable to make the appointment. Get everything in writing so you can confirm start times with your artist and photographer closer to the wedding date. Use your pre-wedding trial to perfect your look for your big day. Note down any reactions to the makeup or products that your artist is using so you can avoid any skin reactions before your honeymoon. Use this trial to confirm start times for your wedding and reception, and what expectations your artist has. 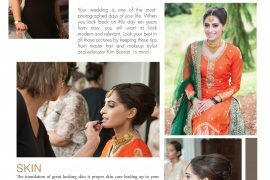 Allot for time to get your actual hair and makeup done, pictures from your artist and photos that your photographer will want to capture. 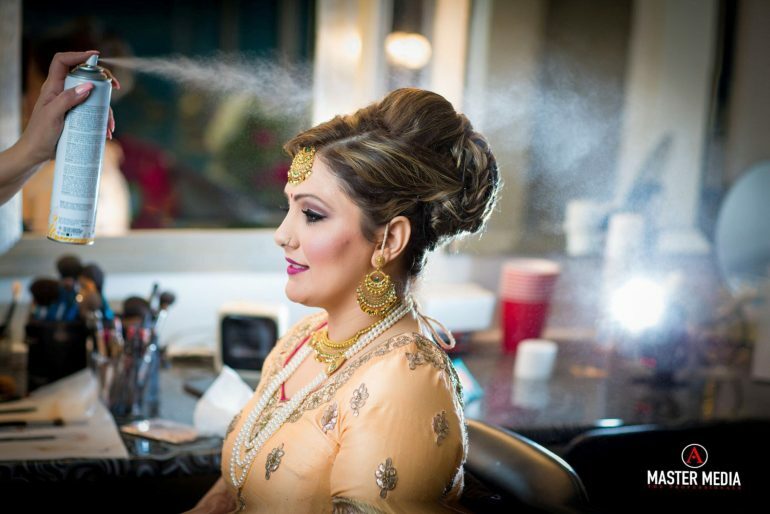 Confirm whether your artist will be bringing touch ups, or if you need to purchase anything ahead of time including: lip color, lashes, lash glue, mascara or pins for your dupatta. Most artists will include this in their bridal package but it’s better to be prepared. This is a great time to touch base with your artist and inform them of any skin issues you’ve been having, last minute schedule changes and to re-confirm your start time. Remember to ask if there is anything specific that your artist needs on the day of like a chair close to a window, no fans or air conditioning on in the room, mirror positioning, etc. Chat with your bridal expert about timing for hair and makeup, photography, chunni pinning, touch up’s, and realistically how long it will take for your photographer to get the images they need. Remember, your makeup and hair artist is an expert who will definitely have more insight into timing than any other vendor so use their expertise to keep you on schedule. Most artists will ask you to be showered with your face clean and moisturized, hair washed and fully dried straight with no product in your hair, with your outfit top on. Make sure you have a few bites to eat before you get started with your appointment and have some water handy for yourself and your bridal team. Have your jewelry and accessories laid out and nearby so your artist can quickly access them. If you’ve discussed touch up’s at your venue, confirm a time for your artist to meet you at your venue. 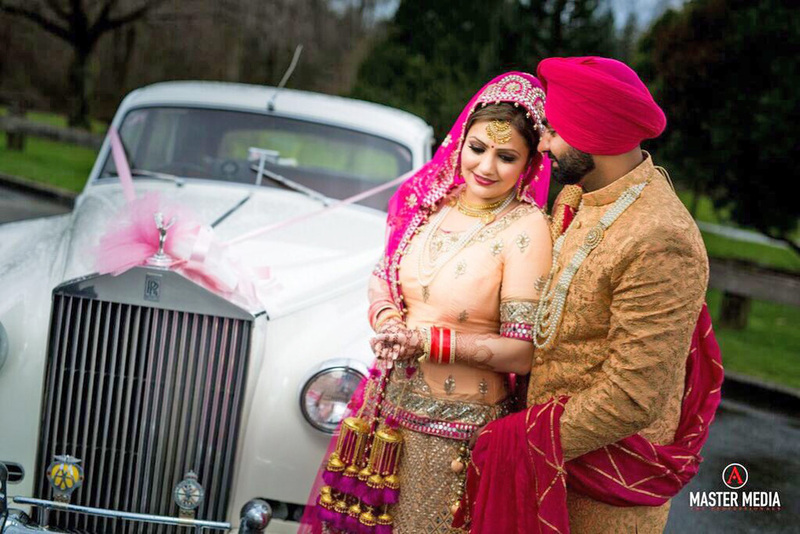 The routine for your reception is generally the same as your wedding. Be showered and moisturized with clean hair fully dried straight, with your outfit top or dress on. Prior to your artist arriving, remember to send a quick text letting them know exactly what your room number is, assuming you’re in a hotel. It’s courteous to take care of their car valet as your artist will be carrying a heavy kit and street parking can be difficult to find. If you’re getting ready at home, make sure you let your artist know where they can park and be available to greet them at your front door. Enjoy wedded bliss! If you’re happy with your artist and experience consider writing them a review and sharing professional photos from your photographer.